The MicroTractor workshop is a 3 day event – led by Marcin Jakubowski, founder of Open Source Ecology (OSE) – and Thomas Griffing, OSE Power Cube Lead Developer. The event takes participants hands-on through a complete build of the MicroTractor. The micro-tractor – the OSE MicroTrac – is a tracked, small-size tractor with a 28 horsepower hydraulic power unit, the Power Cube. The MicroTrac has a quick connect plate and can accept a wide range of implements, from a bucket, backhoe, to a trencher – or it can be used to power other machines – such as a sawmill, brick press, welder, heavy duty lathe, well drilling rig, log splitter, or many others. Workshop immersion involves concept and practice, and includes crash courses on key elements of fabrication, OSE’s modular design methods, CAD, and documentation. Participants become part of OSE’s design and build process, where we produce open source blueprints for the infrastructures of civilization. This workshop focuses on one of the 50 machines of the Global Village Construction Set – an important utility, agriculture, and construction machine – the MicroTrac. Since then, we learned about the importance of traction, especially in rough conditions. Now, we are building upon our structural Power Cube to build a tracked, stand-behind, multipuropose tractor. The three day workshop revolves around the structural Power Cube – a 28 horsepower, hydraulic power unit – built in the Power Cube Workshop right before the MicroTrac Workshop. The first day includes crash courses in welding, torching, and other tool use. The workshop features use of OSE’s open source machines – including the open source 20-ton hole puncher, ironworker machine, and CNC Torch Table. This workshop is intended for people interested in immersion, hands-on skills training and practical results. This immersion course may be especially useful to people who would like to master their own machines and tools, such that the machines can last a lifetime. We will use structural steel tubing construction just like in the Power Cube. Workshop participants will be exposed to modular design – where motors, parts, power units, and other modules can be interchanged between machines. As an example of modularity, we will build a charcoal gasifier after the MicroTractor workshop (not part of this workshop) – so that the MicroTractor – can be run on a locally-produced, carbon-negative biomass resource. We are inviting those individuals who are interested in building their own MicroTractor – or entrepreneurs interested in starting a business. OSE’s goal is to create open, collaborative, ethical enterprise ecosystems that accelerate innovation towards a better world. We are also inviting dedicated documenters and videographers to participate in documenting the build. The overall workshop is designed for people interested in transitioning from Zero to Maker, though those with experience will also learn a number of skills. Can’t weld? We’ll give you a crash course. This course assumes no prior skills outside of general body awareness. Some people will be given documentation tasks if appropriate. Weekend Workshop (July 13-15): Design, Build, and Get Skills. Documentation Track (July 13-15): Document for replicability. As a bonus, we are also screening a pre-release of a documentary film on one of OSE’s collaborations – Reversing the Mississippi. Thomas Griffing has a background in Electrical Engineering, Computer Science, Technical Writing and Hydraulics. He runs a small computer consulting business, instructs Tai Chi classes and also teaches “online” computer classes for a community college in Dallas. He has a farm in East Texas with a shop where he practices permaculture farming, works on projects of interest and sells Power Cube kits, parts and other items. He has also led OSE workshops on fabricating the Power Cube and Micro Power Cube. Tom Griffing is OSE’s Power Cube Lead and has been in Power Cube development since 2011. Fundamentals of welding and custom fabrication – drilling, metal shearing, shop press. 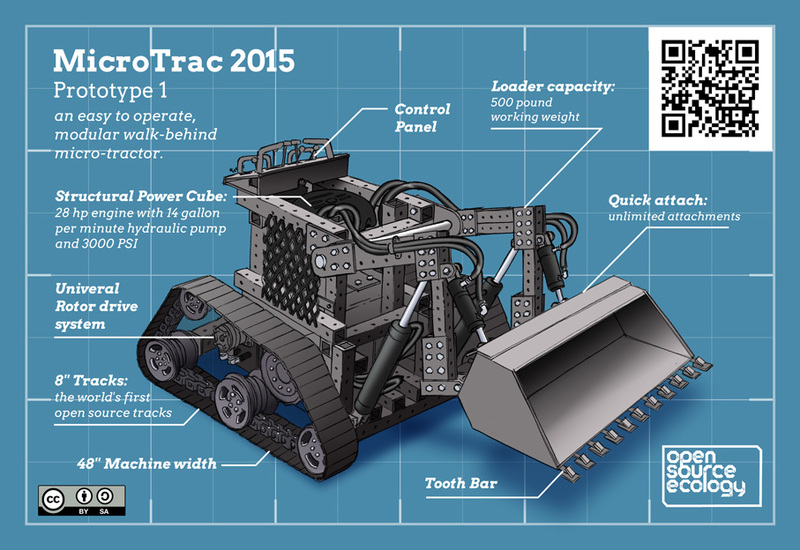 9:30AM: Introduction to the MicroTrac Design and Build Process. Using FreeCAD for manipulating design, Documentation Procedures, Contributing to OSE Development. 11:30AM:Crash Courses in workshop + custom fabrication tools training. Welding, torching, grinding, drilling, CNC Torch Table. Making sample parts. Understanding small engines. Understanding hydraulics. Engine electrical systems. Measurement and data collection. 6:30-7:30PM: Build Workflow, Role Allocation, and Quality Control Presentation. Team Role Allocation. 6:30-8:30: Movie Night Bonus – Reversing the Mississippi – a pre-release screening of a documentary on the collaboration and tractor build with OSE and the Our School at Blair Grocery projects. 8AM-Noon: Finishing assembly. Test run: moving and loader bucket operation. 1PM-5PM: Test run: auger operation; mowing operation if time allows. The workshop starts at 8 AM sharp on Monday morning. Presentations and workshop activity will continue rain or shine. In the event of bad weather, we will do what we can in terms of the site tour. If rainy weather is in the forecast, please bring rain gear. Sponsor another participant: Sponsor $350 to fund attendance of someone who is on the waiting list for financial assistance. Discounts for Students and Low Income Individuals: If you are a student or in need, your cost is 50% off for any of the options. If this is still beyond your means, we can consider Work Exchange, where you stay an extra day to help with site preparation and cleanup. You pay a deep discounted rate of $15/day. Email us for details. 2-for-1 Discounts: Select 1 or 2 day option, and bring a family member or friend with you for free. If for any reason you can’t attend a workshop you registered for we will be happy to (a) transfer you credit towards another MicroTrac workshop in the future; (b) or equivalent credit towards any other other OSE workshop; (c) substitute the name on your ticket and have a friend take your place.